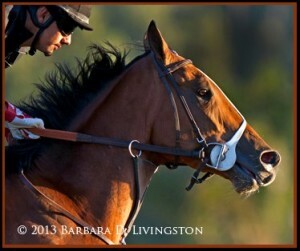 Goldencents is set and ready to run the much-anticipated Santa Anita Derby tomorrow, April 6, 2013. The internationally known facebook superstar will break from post position #5 and is a leading contender on the Kentucky Derby Trail. 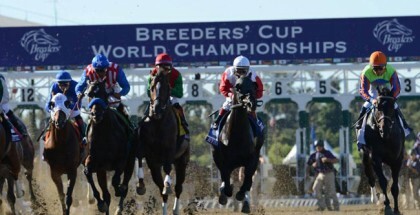 Goldencents is trained by Doug O’Neill and owned by WC Racing, Dave Kenney, and Louisville Coach Rick Pitino. Lady and The Track had a casual sit-down with Doug O’Neill to find out everything from what challenges he endures while training world famous thoroughbreds, to why he grew a beard last year! We also learned that Goldencents was a little shy around humans at the beginning and that he is very secure with his man/horse-hood! Trixie: How many horses do you currently train? Doug O’Neill: We currently have 103 horses in training. Trixie: Are you superstitious before a big race? If so, do you perform any strange rituals? 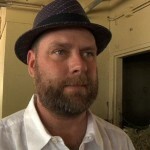 Doug O’Neill: Nah, you make your own luck, but I have to admit I didn’t shave once I’ll Have Another won the Santa Anita Derby last year and kept the beard throughout the Triple Crown run. Trixie: Who did you look up to as a mentor when you were just starting out? Doug O’Neill: So many influences, of course all the trainers that I worked with before going out on my own you learn from the ground up and they kept me humble. Trixie: Who do you admire the most out of the current trainers? Doug O’Neill: You have to respect Bob Baffert, Todd Pletcher and the guys that consistently show up each year with a new stable of future stars. There are a lot of them, some aren’t on the national spotlight that I think do a great job as well. Trixie: What do you do for fun when you’re not at the barn or track? Doug O’Neill: Being at the track is fun for me, its my life. I am here six days a week. When I can I love spending time with my family. Trixie: What advice would you give a beginner at the track? Doug O’Neill: BET, they will always win their first race they bet on. That’s how the track gods get you to come back! Trixie: Do you have any up-and-comers at your barn that we should take note of? Doug O’Neill: We have several two year olds that were recently purchased at the sales and privately that we are excited about. I have never had so many two year olds in my trainer career, as I do now. I think I will keep their names under my cap for now. Trixie: We notice you’re very stylish on big race days. Do you think fashion is an important part of a typical race day experience? Doug O’Neill: I think getting dressed up for any occasion makes it seem more special. At Santa Anita specifically they work hard to bring a fashion and fun element to the track. Trixie: What are your biggest challenges while training horses? Doug O’Neill: Doing everything you can to have the horse ready for its race and it doesn’t perform to you and the owners expectations. You never know when an injury will take you out of a race, like with I’ll Have Another, but you adjust, regroup and fight another day. Trixie: Please tell us something about you that fans may be surprised to know. Doug O’Neill: If I told you that, it wouldn’t be a surprise any longer! Trixie: Goldencents has a witty sense of humor on facebook, can you tell us who is behind his facebook persona? Doug O’Neill: We like to keep that underwraps but the person is part horse we are sure of that. Trixie: Does Goldencents have a nickname around the barn? Doug O’Neill: We call him “Goldie”, he knows it’s a feminine name, but he is secure in his man, uh horsehood. Trixie: Can you tell us about Goldencents’s personality traits? What is his demeanor typically like? Doug O’Neill: When he first came to us he was a bit standoffish, didn’t really interact much. And he tried to escape once or twice, but as he has grown and matured he has discovered that people are fun and he loves the attention. He is a typical colt a little bit of a biter if you let him get away with it. But he has his mind on business most of the time. He has a relaxed way about him, that’s why I think he and Kevin Krigger get a long so well. They have the same personality. 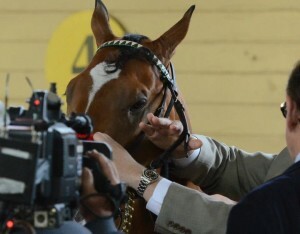 Trixie: What makes Goldencents so special? How does he differ from the other colts in your barn? How does he compare to He’s Had Enough? Doug O’Neill: He just has a great mind, he knows his job, he keeps improving and he has a lot of natural ability. He isn’t as big as He’s Had Enough, and HHE is a tough customer, it takes a village to wrangle him. Trixie: What is your favorite Goldencents moment to date? Doug O’Neill: In racing I’d say his winning the Delta Jackpot was significant and a great memory and hopefully tomorrow in the Santa Anita Derby, we make a new, more memorable one! 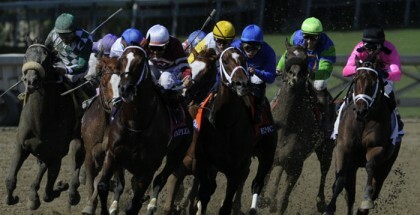 Trixie: Fans are excited to see Goldencents run on April 6th in the Santa Anita Derby. Will this be his only race before the Kentucky Derby? Doug O’Neill: Yes, its his final prep for the Kentucky Derby and we are super pumped about his chances. Trixie: What are Goldencents favorite treats? Doug O’Neill: Mrs. Pastures cookies are the treat of choice in our barn. He likes peppermints too. 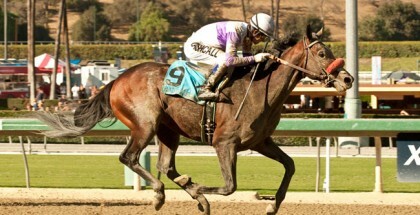 To find out more about Doug O’Neill and his beautiful horses, please visit dougoneillracing.com. You can also follow Goldencents on facebook! 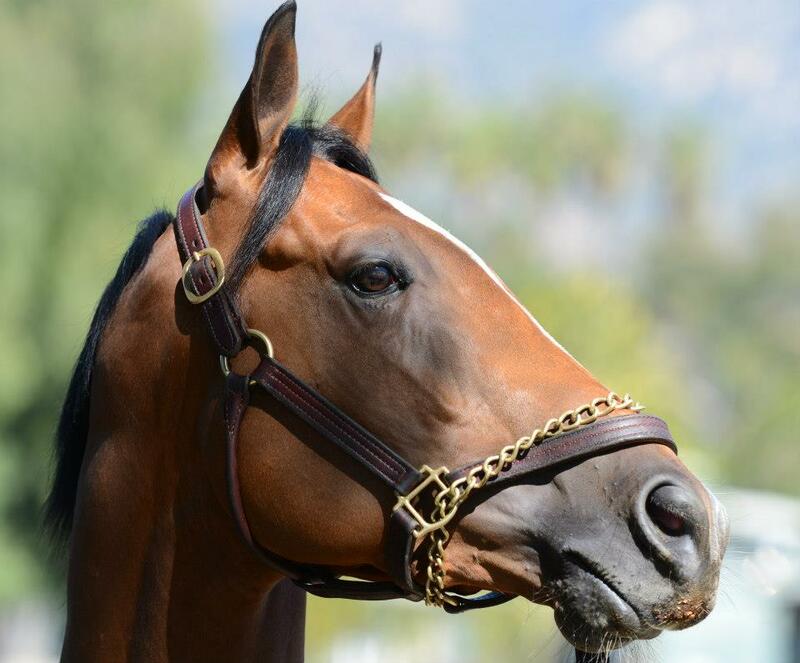 UPDATE: Shortly after posting this interview, Goldencents won the Santa Anita Derby on April 6, 2013. The video below captures it all. Enjoy! Congratulations to Kevin Krigger, WC Racing, Coach Rick Pitino, Doug O’Neill, and the magnificent Goldencents on their exciting win!